Family Wellness features a variety of programs, classes, and services designed to keep the pep in your step. Equipment Orientation is a free 30 minute session with a trainer to show members how to properly use various pieces of equipment. Member communicates to the trainer what needs or pieces that they would like to learn how to use correctly. Take advantage of our on-site coffee and social areas to make some new friends and help keep each other accountable. Family Wellness is proud to partner with SilverSneakers ® and Silver n Fit programs. Contact your insurance provider to see if you already participate. We can also look up to see if you are listed as eligible. Silver n Fit members need to renew yearly. Join others as you pursue your fitness goals together in fun group programs. Our instructors guide you through the program and help you modify exercises according to your fitness level. You’ll be challenged to achieve your best in a supportive environment. 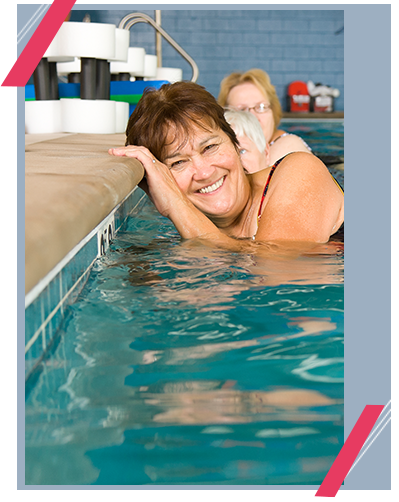 Our land or water exercise classes developed specifically for our active older adults. SilverSneakers ® Classic: In SilverSneaker Classic have fun and move to the music through a variety of exercises designed to increase muscular strength, range of movement and activities for daily living. Hand-held weights, elastic tubing with handles, and a SilverSneakers ball are offered for resistance. A chair is used for seated and/or standing support. Gold N Fit: This is a Cardiovascular class for seniors or anyone who wishes to stay fit forever. Come swing to some of your favorite old tunes and receive a low impact workout at the same time. Special considerations will be made for those with arthritis or joint difficulty. Gold N Tone: In Gold N Tone have fun and move to the music through a variety of exercises designed to increase muscular strength, range of movement and activities for daily living. Hand-held weights, elastic tubing with handles, and a ball are offered for resistance. A chair is used for seated and/or standing support. Silver Cycle: Silver Cycle is similar to our other indoor cycling classes but is designed for our more mature member’s abilities and enjoyment. You will get an awesome cardio workout as you ride at a basic, slow, and steady pace while listening to great & motivating music. Our instructors are trained to work with this growing population. No experience is necessary and all fitness levels are welcome! Rapid Liquid Cardio 40 minutes of non-stop cardio intervals. It starts with a combination of aqua sprints, punches, and kicks will leave you sweating in the water, followed by strengthening and toning using varying aqua tools and water resistance. This class is challenging and exciting – working in this liquid room will keep you inspired and wanting more! AquaFit This class combines segments of cardio and strength training using water approved weight resistance tools. AquaFit is designed for all fitness levels using equipment that helps drive a quality aqua experience resulting in a toned and functional body covering strength, cardio, and mobility, well enough to wear you out! SilverSneakers ® Splash Activate your aqua urge for variety! SilverSplash offers lots of fun and shallow water moves to improve agility, flexibility and cardiovascular endurance. No swimming ability is required, and a special SilverSneakers kickboard is used to develop strength, balance and coordination. Hydro Conditioning Maximize your workout with this fast paced workout for intermediate to advanced levels. The class provides both cardio and resistance training while emphasizing proper form for improving core and total body strength. Instructor will take participants through a variety of exercises including intervals and circuits. Hydro Power A powerful mix of Cardio and strength in an interval environment. Intervals will alternate between cardio-based exercises and strength-based. The water, along with other equipment will challenge all aspects of the body and increase your physical fitness level. Tai Chi Chih is a series of slow, soft movements that help to circulate energy throughout the body. When done regularly, it can produce relaxation, create more energy, and improve physical and mental health. For many, it promotes weight loss, increased joint movement, blood pressure reduction, and improvements in mental clarity. Yogaflow Open to all levels of practice and abilities, our soothing gentle class focuses on an exploration of yoga poses and how to connect them through attention to breathing, alignment and mindfulness. Therapeutic in nature, you will learn techniques to help you gain flexibility, while immersing yourself in a relaxing class that allows ample time to enjoy each pose. Expect lots of stretching & lingering in supported seated poses. Meditation and relaxation techniques will also be introduced, perfect for stress relief and overall well being. Restorative Yoga Soothe your soul in this restorative class! Restorative yoga is typically done on the floor with lots of supportive props coupled with soothing music to help the body release. Restorative poses are an important part of any long-term yoga practice: they recharge our energy reserves, heal the effects of stress, and bring our nervous systems into a more balanced state. This class will leave you feeling relaxed, refreshed and renewed. Appropriate for all levels. We will be offering Medical Education classes at our facility. These classes will happen every first Wednesday of the month. There will be a new topic and speaker each meeting time. Classes start at 10:30 in our Wellness Education room, this will be a 30 minute presentation followed by 30 minutes of Q & A. For upcoming topics, check online on the Events Calendar or around the Family Wellness facility. Free to attend. Monthly topics can be found online, at the Front Desk or by calling 701.234.2400. Family Wellness is proud to offer a variety of classes and programs that teach simple kitchen skills for healthy food preparation. With classes for kids, adults, and families we’ve got something sure to inspire you to make healthier food choices for you and your family! Have questions? Connect with Nicolle, Active Older Adult Coordinator at 701-234-8162 or Nicolle.Aukland@SanfordHealth.org.